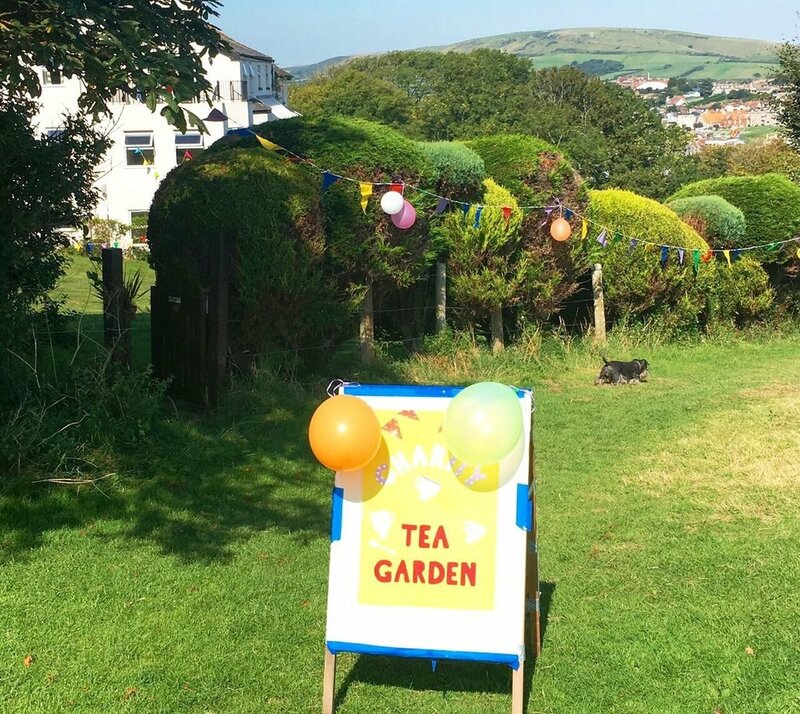 A successful tea garden and book sale was held in Swanage, Dorset, which introduced many new people to the Bujagali Trust. On two successive beautiful sunny afternoons visitors to the seaside town enjoyed the tranquility and fabulous view from the garden overlooking the bay. Tea was drunk, many cakes were consumed, and the book shelves browsed for holiday reading or a bargain to take home. The event was enjoyed by all and we thank everyone who contributed to support the work of the trust. You can read our latest newsletter here. If you'd like a downloadable version please contact us. Tom and Tina Riley visited Mama Elisabeth as part of their honeymoon early in the new year. 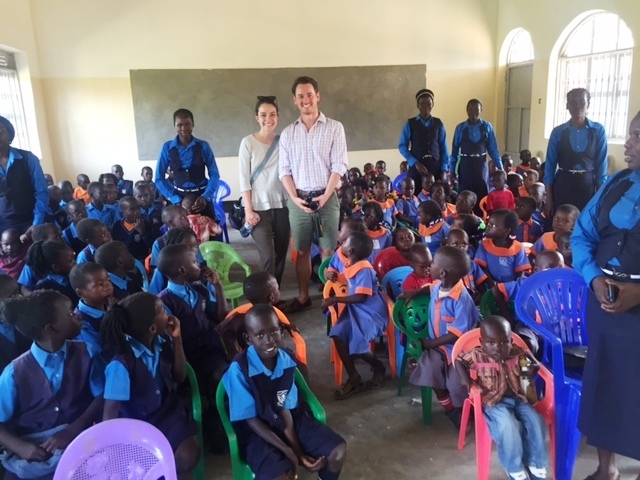 They were welcomed by Patrick and Grace Lumumba along with all the staff and children of the school. The new Hall was put to good use for a celebration of singing and dancing. 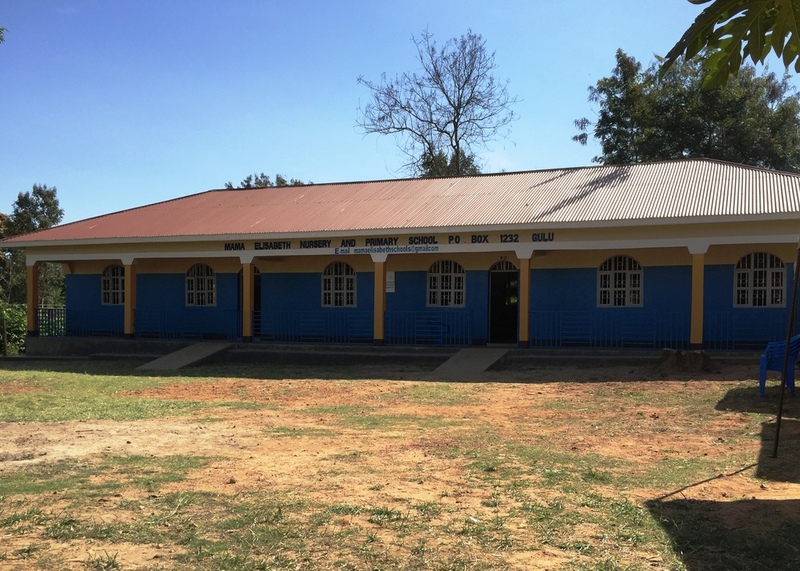 We are delighted to report that our latest project has been completed at Mama Elisabeth School in Gulu. 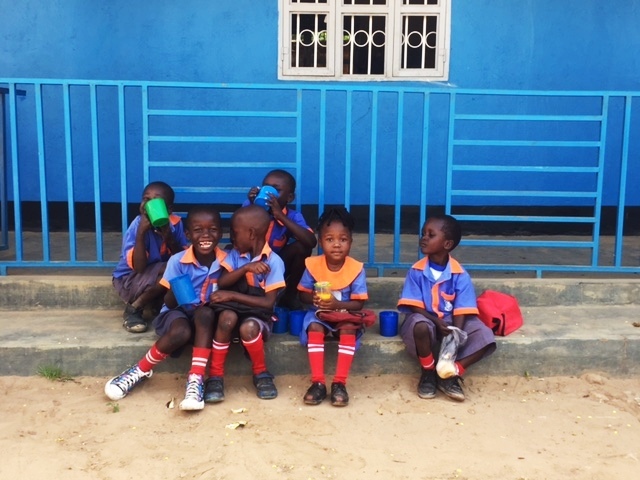 The Bujagali Trust has financed a new multipurpose Hall, which will enable the whole school to come together for assemblies and meetings, allow children to eat lunch under cover in the rainy season, provide accommodation for exams, and will double up as extra classroom space. The construction was well managed by the team at Mama Elisabeth, who were helped enormously by the contributions of many in the local community. The opening ceremony was a great day. About 600 people attended: parents, children, and staff were joined by members of the local community including political and religious leaders, and representatives from the other institutions including the army and police. Great fun was had by all and there was much singing and dancing. 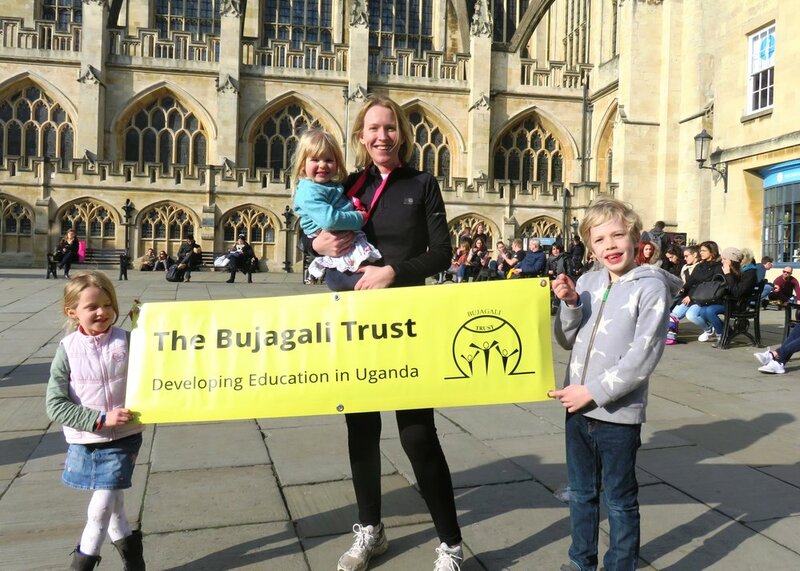 We are hugely grateful to Leander Woodbridge, who ran the Bath Half Marathon, raising money for the Bujagali Trust. She trained hard in preparation - and it paid off on the day. The whole family turned out to cheer her on and she was able to run a great time, beating her personal best for the event. This was a great achievement in terms of the running, the fundraising and the friend-raising. Everyone we support in Uganda will be extremely grateful for the generosity of those who sponsored Leander. Much can be done with even small amounts of money. Thanks to Leander and all her supporters! 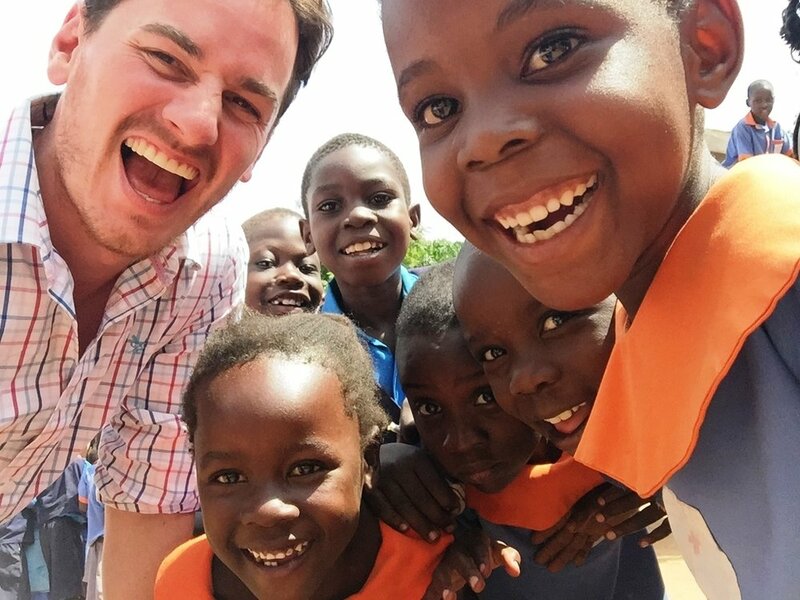 Barry Hollinghurst (Trustee) and John Griffiths (Friend of the Bujagali Trust) visited Uganda in the Spring and spent a whirlwind week travelling around to see our work in action. In the Kumi district of Eastern Uganda they visited Kalengo Primary School, a recent project, which we have supported by providing books, desks, and scholastic materials. This was the first visit to the area by a member of the Trust and the staff and students were delighted to show Barry and John around. Our local friends Martin and Grace Adakum accompanied them and Grace gave the pupils sounds advice about working hard to achieve good results. Two additional local schools were visited and their needs discussed. We hope to expand our support for the children in this very needy area. 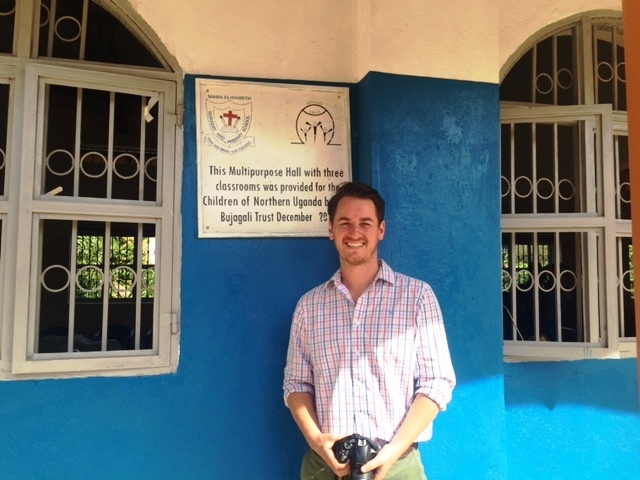 The second stop was Mama Elisabeth Nursery and Primary School, Gulu, in the north of Uganda. Here, Barry and John were pleased to see the new classroom block funded by the Bujagali Trust and built last year. They were impressed by the involvement of the local community, which has embraced the project, contributing hands-on help with the building in many different ways. The school is well run by its founder and Director Grace Ajok. Further development work will include upgrading the toilets and the kitchen facilities, and creating a library. There is still plenty of work to be done! 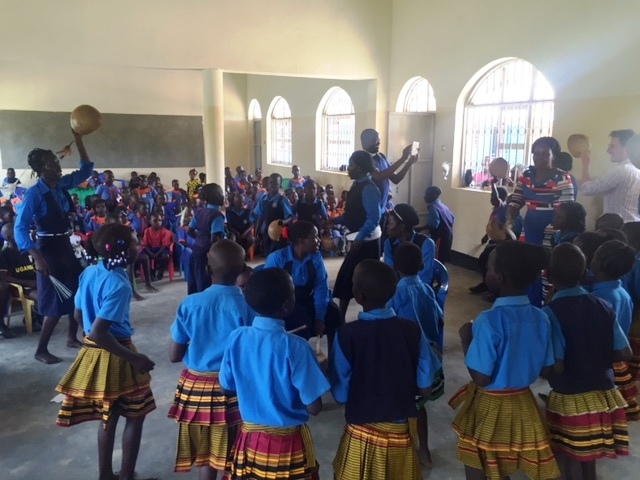 The children of Mama Elisabeth entertained their visitors with traditional singing and dancing. Our third area is in and around Jinja, a beautiful spot on the shores of Lake Victoria. Barry and John reported that Mutai Secondary School was tidy and well cared for, with the agricultural department in particular looking good. The students were pleased to receive some new footballs and netballs. Great Hopes Primary School has benefited from support given by the Jinja Educational Trust, who have provided new buildings. This is a challenging project in a remote area on very steeply sloping land. Barry and John took a new supply of stationery with them and identified future needs.